Moth sailors around the World know our boats are quick, and also very efficient, but try and explain a foiling gybe to some other sailors and you are met with blank looks. Nobody seems to believe you that the apparent blows from the bow mid gybe. 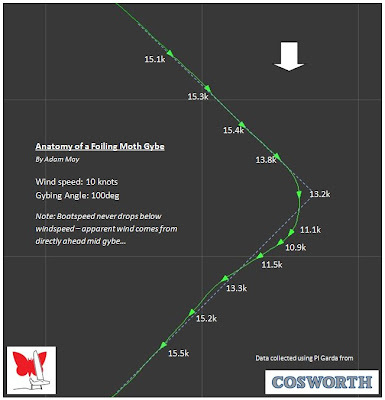 Hopefully these diagrams should be of interest to some Mothies and a few other sailors out there. I’ve got quite a list of things to look at while testing the PI Garda box, but a diagram I saw in Seahorse has been in the back of my mind and I wanted to do a Moth version. In the Jan 2008 edition there was a great article by Steve Killing on the 2007 International C-Class Catamaran Championship, and there was a diagram that accompanied the text showing the anatomy of a C-Class gybe. I thought this was quite interesting, and following my own observations during the event I thought a foilborne gybe would be nice to try and show in this format. I’ll try and get some screen grabs from the video to go with it soon. These gybes were selected for the consistency of the trace before and after the gybe. I got a bit carried away with having the box on, that I did quite a few gybes in quick succession and so the track wasn’t very smooth between them, with the exit from one gybe blending into the entry to the next. The gybes shown here are gybes 2, and 5 of the day, and probably not my best, but representative of good foiling gybes (I hope!). Both plots show the point of lowest speed, and when I was heading directly downwind. I got a bit more organised for the second plot, and all the points except the lowest speed one are separated by 2 seconds. So the average gybe takes about 10 seconds if you think of it terms of time taken from average reaching speed on one tack to getting back up to that speed on the other tack. This seems like a long time, but then you watch the video and it doesn’t seem that long. Now consider that your average VMG downwind through the whole manoeuvre is only just less than your standard VMG numbers…. Good gybes in these conditions have minimal loss, and open up a host of tactical options. Top speed measured on the day was 19.1 knots in 10.0 knots of breeze. Plenty more data coming as I learn more about the software and what it can do. Like the traces, I will be back in the office wednesday and can send you the Google Earth tool for the traces. Nice info. 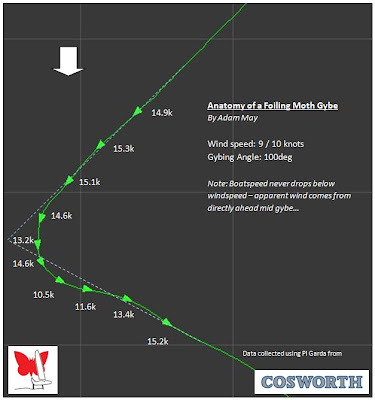 It is great to know that a good foiling gybe does not really loose you ground downwind as our races should be very tactical downwind. What about facking upwind? Awesome post. Good to see the data capture system producing intelligible results already. After a sail can you put the weather station on a stick and produce a plot of windspeed variation with height up to mast tip. Do this for a few different wind speeds and you should be able to determine a correction factor for windspeed at sheerline. what is the info when you foil tack, or don't you have that info yet?